This blog is the first in our series on “Waste & Climate solutions” from around the world. We are releasing this series to mark the final push before COP21, and will release a different climate and waste solution from a different region for the next 4 days until 27 September. This edition covers the municipal composting scheme implemented in São Paulo, which gathered large numbers of participants and was responsible for preventing 250 tons of food waste from going to landfill and thereby preventing the greenhouse gas (GHG) emissions associated with the landfilling of organic waste. To find out more about the ‘Power of Compost’ have a look at our post for International Compost Awareness Week or our report back on our organics management training. Read our second post in the series, on Boston’s worker co-operative recycling company. Although landfills have not always been the main destination for waste in São Paulo, this practice was massively expanded until it reached a critical situation in 2013. Until then, 100% of the organic waste, 95% of dry waste and 100% of all residual waste would go directly to two specific landfills, the CTL Landfill (Central Waste Treatment Leste) and the Caieiras Landfill. The motivation to reverse this situation was triggered by changes in legal obligations within the new Solid Waste National Policy (PNRS)i, and the urgency of extending the life of these landfills to save land space in the metropolitan region. Moreover, the solid waste management sector in São Paulo was the second largest source of GHG emissions (Municipal Inventory, 2012), being responsible for the 15.6% of the total GHG emissions in the city, 14% of those coming from landfills. In this way, reducing the contribution of the waste sector to the carbon footprint of the city was critical, and composting was a particularly well-suited opportunity, as studies showed that the practice of composting would potentially decrease 5-10 times the emissions of methane in landfills,ii integrate efforts to reduce leachate while increasing the benefits from retaining organic matter to provide nutrients and improve soil properties in the state of São Paulo. The implementation of the Solid Waste National Policy (PNRS) began with citizens participating in 58 events with more than 7,000 participants, which was organised by the Public Administration of São Paulo. 800 delegates elected by thousands of São Paulo citizens and supported by experts and technicians from the authority ad hoc, agreed on the main guidelines as to what to do with the waste generated in the city. These points formed part of the Integrated Solid Waste Management Plan of the city of São Paulo – PGIRS, published in early 2014, and determined the recovery, over twenty years, of 80% of all compostable waste and recyclable waste. Among the approved guidelines, source separation of organic waste, selective collection, composting, mechanical biological treatment (MBT) and promotion of home composting were included. 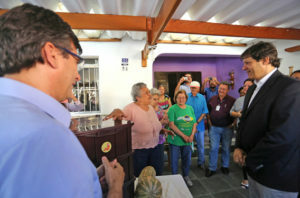 Home composting began to be encouraged by the government of São Paulo shortly after the publication of the PGIRS in June 2014 by delivering compost bins to houses. In six months, 250 tons of organic waste were recovered. The project called “Composta São Paulo” handed kits for home composting with worms to 2,006 households in the city of São Paulo. Through a public announcement, the project achieved 10,061 registrations in 40 days on the website, from various regions of São Paulo. Those selected were from 539 apartments and 1,467 houses in eight regions. “Now I pay a lot of attention to my organic waste and also my neighbours waste. I’m more critical of how much food to buy. I have affection for worms”, said one of the participants in the “Composta São Paulo” 2014 program. The delivery of compost bins was accompanied by 135 training workshops for over 5,000 participants. Participants were encouraged to respond to scheduled polls and assume the role of multipliers of home composting. After two months, the participants were invited to other workshops (88 workshops), where they received advice and techniques for planting in small spaces in order to use the produced compost. The questions and concerns raised were shared and addressed in a virtual community on Facebook. 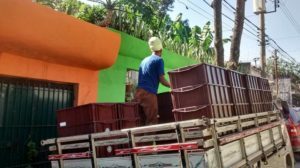 The community of “composters” (comunidad de “composteros”) finished the first year of the project with more than 6,000 members. Subsequent information gathering on program results indicated that 89% of participants significantly decreased the amount of waste for collection. There were no significant differences in the evaluation of the practice of composting between social classes or between types of housing and only 47 households (2.3%) gave up the activity. Meanwhile, 97% of respondents of a survey to measure the level of satisfaction (1,535 people) were satisfied or very satisfied with the technique, 98% considered it a good solution for organic waste and 86% considered it easy to practice. Linking the practice of home composting with participation was an important part of the communication strategy developed for this program in terms of the involvement of the population. In addition to the novelty of the composting process itself, and the use of modern techniques of social communication aroused interest in the project, and the desire to “be a part”. The multiplier effect was immediate. The results of the survey indicated that 29% helped others who did not receive compost bin, to make, install or manage one. Participants witnessed a contagious effect, which attracted 2,525 new people to try to assemble or buy their own composting system. “We realized that every time we went to throw the waste into the compost bin we felt a deep sense of wellbeing … kind of like we had stopped making the city a dirty place and turned garbage into flowers. We exchanged ideas with other people who were doing composting and they had the same feeling! Composting is therapeutic!”, read the testimony of another participant at the “Composta São Paulo” 2014 program. 27% of participants donated worms for others to start practice. Also, behavioural changes in other areas also came to light: 84% said they greatly expanded their knowledge of urban sustainability; 96% considered themselves far more diligent in handling properly the waste produced; and 54% said they began to eat a lot more fruits and vegetables. The new “master composters”: dream big, start small, and act now! 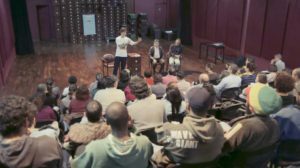 The 2,525 new participants, excited by the project members themselves, are a sign of the potential for citizens to transition from mere objects of public policy to true subjects in the exercise of their citizenship: in this case, transforming themselves from “trained” to “master composters”. By attracting new participants and sharing their learning, project members should be recognized for what they really are: “master composters”. On the other end, public managers are called to support what people can build. Just dream big, start small, and act now. Home composting is an empowering tool for public policy, and of collective commitments, with a multiplier effect that encourages responsible behaviour with base on joy, discovery and learning. i Obligation to recover waste under the National Solid Waste Policy – PNRS, approved in 2010.
ii Inacio, Caio de Teves. O papel da compostagem de resíduos orgânicos urbanos na mitigação de emissão de metano. Caio de Teves Inácio, Daniel Beltrão Bettio e Paul Richard Momsen Miller. Embrapa Solos, 2010. 22 p.
iii Calculations estimated by Dan Moche, former Coordinator at the Organic Waste PIGRS of Sao Paulo. Internal economic analysis of the Municipality of Sao Paulo.